It is widely accepted that a build up of marine life on the surface of a boat’s propeller and drive shaft negatively impacts engine efficiency and performance. Even if the prop has a thin layer of growth on it’s surface area, fuel efficiency is reduced by a significant amount. To counter this problem, engineers have turned to developing “super-slick” coatings. When the drive is engaged, and the prop begins to move, any organisms attempting to adhere to the prop simply slide right off! No chemicals are used to poison or kill the organisms in the environment. How do PropOne* and PropGlide compare? Which coating gives you the most bang for your buck? In terms of performance, both slick coatings are equally good. They do the job and do it well. It is too early to say which product will outlast the other in the minds of consumers. But for right now, we recommend PropGlide as opposed to PropOne. The savings alone makes PropGlide worth every penny. *PropOne was formerly known as PropGold. It is essentially the same product, just a different brand name. ***Above PropOne prices and PropGlide Prices are based on internet web search December 2016. This entry was posted in Foul Release Coatings, Prop Coatings and tagged antifouling prop paints, best foul release coating, compare propgold, compare propone, foul release coating, propgold, propone, propone alternative, propone price, propone review on December 28, 2016 by Dustin Wilber. Propspeed is a coating system designed and proven to increase vessels’ speed and fuel efficiency and greatly reduce marine growth from bonding to metal surfaces below the waterline. Propspeed works because it’s slick, not because it’s toxic. The Propspeed system can be applied to any metal surface below the waterline, including propellers, shafts, bow thrusters, rudders, trim tabs, struts, stabilizers, sea chests, sea strainers, keel coolers and through hull fittings. The Clear Top Coat without the use of the etching primer can be used on plastic based items such as underwater lights, composite propellers and plastic bow thrusters. The Propspeed system has been developed over many years of trial and error and has been refined to give exceptional performance throughout the world. • The preparation and application instructions should be followed to ensure you get a satisfactory result. Taking shortcuts will reduce the durability and longevity of the system. • Propspeed should only be applied by a qualified applicator. • As with any coating systems, environmental influences will vary the cure rate of the coatings and this needs to be taken into account by the applicator. • We recommend a minimum application temperature of 5°C or 40°F with recommended humidity not exceeding 85%. • Electrolysis of a vessel or even a vessel moored nearby can adversely affect the coating system of the running gear. Marinas with 400 volt supply to vessels are more prone to neighbors’ vessels being affected. • Propspeed clear coat is a soft coating and is easily damaged by mechanical abrasion, fi shing tackle or ropes around the running gear. Vessels used in shallow, sandy areas are also prone to mechanical abrasion of the clear coat. • Vessel owners using a dive service should inform their diver that Propspeed has been applied to the running gear, and any other areas, so that the diver can use proper cleaning methods to avoid damaging the Prospeed system. • The Propspeed system is not recommended nor approved for use in aquaculture or contact with food products. The Propspeed application is a simple process, involving surface preparation, metal conditioning and a catalyzed etching primer, followed by a silicone based topcoat. The process to apply Propspeed to your running gear isn’t difficult, but the process must be strictly adhered to in order to get a superior result. For this reason we strongly recommend using a Propspeed approved applicator, or an experienced marine painter. Propspeed doesn’t require any special equipment in its application. All you need is: a dual action sander, some 80 grit sandpaper, both wet and dry, plenty of rags, plastic mixing containers, disposable brushes, disposable foam rollers, disposable plastic paint trays, mixing sticks, paper paint suits, disposable gloves, eye protection and dust sanding mask. As is the case with all surface coatings the preparation of the surface to be coated for the application of Propspeed is key. The old Propspeed coating needs to be removed completely before the new system can be applied. Any previously applied Propspeed on propellers, rudders and drive shafts should be high pressure cleaned, removing all marine foul from surfaces, then be allowed sufficient time to thoroughly dry. Propspeed can be removed by sanding using 80-grit sandpaper. A dual action or air driven sander can be used and difficult areas wet sanded by hand. New to our range is the revolutionary Propstrip. This is a safe, low toxicity remover that is totally water neutralized. The product can reduce the labour cost to remove Propspeed by up to 70%, as well as reducing dust and noise in the boat yard, and cutting the expense of abrasives. For yards without a water catchment process, this system also enables all of the waste and removed product to be captured and processed to a waste container. For this process we recommend the use of hessian or burlap sacking placed under the area, so the removed product washes off onto the sacking. The water will drain through the hessian sacking, capturing the old Propspeed, and the hessian sacking can be rolled up and all waste placed in the waste container. Good work practice is always recommended with the wearing of protective hand and eyewear. Mask off any surface of the vessel that the Propstrip could splash or drip onto. • Make sure the area you are working with is totally dry: Propstrip DOES NOT like any moisture. Water de-activates the Propstrip completely. • Ensure any areas that are not being treated are adequately protected from Propstrip. • Dependent on the remaining wear layer of the silicone topcoat the Propspeed may first need to be abraded with 80 grit sandpaper. This enables the Propstrip to work more effectively by penetrating the silicone faster. • Apply Propstrip liberally with a brush ensuring there is a thick coating on 100% of the surface being treated allowing for complete saturation of the part. • In cold conditions, 10-15°C or 50-60°F, it could take up to 3 hours to release the old Propspeed or if colder, it may take longer than 3 hours. • In hot conditions above 35°C or 95°F it may be necessary to ensure the treated area is in shade to prevent the application from drying out while performing its action. The product works faster in hot conditons, so within 1 to 3 hours you should begin to visually observe the discoloration of the old Propspeed. • When the product has started to bubble and change colour, this is a good sign that it is doing its job. Test a small area with a scraper to see if it will freely release from the substrate. Once ready, wash with a hose or a bucket of water and a Scotch-Brite pad. • Any remaining product is removed using a wet Scotch-Brite pad or wet/dry sandpaper. Once the surface to be coated has had the old Propspeed chemically or mechanically removed its now time to clean the surface with the Propclean solution. From this stage of the application forward there should be no direct hand contact with the areas that are to be coated with Propspeed. The reason for this is that the oils on your fingers and hands will be transferred to the surface that is to be coated and this may cause the coating to fail. Plastic or latex gloves should be worn at all times. If you need to change gloves frequently then do so. Make sure you have an abundance of rags on hand for the next two steps. Clean the surface with Propclean. Immediately wipe the surface with a clean dry rag. Repeat until there is no residue left. Apply Propprep solution liberally with a clean rag or use the Propprep wipes. Immediately wipe the surface with a clean dry rag to ensure no residue is left. Propprep is essential in the chemical preparation of the metal substrate to be coated with Propspeed. It contains ingredients that react with the metal creating a surface porous layer. This porous layer is key to ensuring penetration and completion of the self etching reaction of the primer to the metal substrate. Propprep also ensures that no free alkalinity, as a result of various soap/detergent washing, is present to interfere with the self etching primer reaction and adhesion to the metal substrate. Ambient temperature has an effect on the application of Propspeed and the drying times of the Metal Etching Primer and the Clear Top Coat. We recommend a minimum temperature of 5°C or 40°F. It is recommended to avoid applying the product in direct sunlight or humidity above 85%. mixed before adding the etching primer hardener. This can be done quite easily using a mixing stick or Propspeed Paint Stir Wheels. This usually takes no more than two or three minutes. Note: Failure to thoroughly mix the etching primer base, as described above, may lead to premature hardening, inconsistencies and short life expectancy of the final coating system. Once the etching primer base has been thoroughly stirred and there are no solids left in the bottom of the can you can now add the etching primer hardener to the etching primer base. The mixing ratio of etching primer base to etching primer hardener is four parts base to one part hardener. However we recommend that you mix the etching primer hardener right into the etching primer base container thereby ensuring an accurate measurement. Once mixed together, use immediately. Any product not being used immediately can be left in the sealed can in the shade for up to six hours. You can apply your primer with brushes and or foam rollers. For spray applications, please consult your Propspeed Technical Representative regarding specialized projects such as keel coolers and sea strainers. The application process must be well planned due to times in between coats and may require two applicators. The timing of each coat is essential to enable the required chemical bond between coats. The Propspeed system requires two generous coats of etching primer. To access all parts of the propeller and shaft we recommend turning the prop using a brush, wooden stick, or gloved hands. Once you have applied the first coat of etching primer wait approximately 3 to 5 minutes before applying the next coat. To test if it is ready use the dry-to-touch test method. If you take your index finger in a glove and touch the wet etching primer and it leaves a small print on the primed surface but no etching primer transfers to your fingertip of your glove, then you can begin applying the next coat. The wait between coats of etching primer is very important and must be adhered to. Make sure you have some idea of how time is progressing. Using 27°C or 80°F as a benchmark you have 3 to 5 minutes from the start of applying the fi rst coat of etching primer to the start of applying the second. Cooler temperatures will slow down the recoat time between the two coats, as will warmer temperatures and windy conditions speed-up the recoat time between the two. Before applying the clear coat take another paint stick and stir the clear coat so you have a smooth, homogeneous mixture in the can. The 3 to 5 minute wait between coats applies here too – use the dry to touch test to check if the etching primer has dried suffi ciently before applying the clear coat. Apply the clear coat with a brush only, NO foam roller application is to be used here. The clear coat is applied and brushed much like conventional varnish. As with the etching primer to access all parts of the propeller and shaft we recommend turning the prop using a brush, wooden stick or gloved hands. Make sure there are no heavy runs or sags in the clear coat. You’ll have anywhere from 5 to 10 minutes to touch these up. Any drips that harden on the edges of the propeller blades can be carefully cut off the following day. Make sure the surface is completely coated with clear coat. Any missed areas will appear dull in luster. When you have fi nished coating the entire propeller with clear coat, give the propeller one more visual inspection just to make sure there are no areas that you might have missed and to check again that there are no runs in the clear coat. Once the running gear has been coated clean up the contaminated waste products and dispose of as required by your local council or marine laws. Propspeed requires a minimum of eight hours to dry before launching. In cold conditions, 5-13°C / 40-60°F, we recommend at least 24 hours drying before launching. Unlike traditional bottom paints Propspeed’s effectiveness is not adversely affected by sitting out of the water for extended periods of time in warm or cold climates. Any coated areas will need to be protected from damage. • Application of Propspeed requires planning so make sure you have all of the required application equipment and thoroughly understand the process. • Wear protective respiratory, eye and skin protection. • Remember to remove all of the solids at the bottom of the primer container and stir it into a homogeneous mixture before applying the primer hardener. • Be sure to keep track of time between etching primer coats and the clear coat. The 3 to 5 minute re-coat windows are critical and subject to your ambient application temperature. • Be sure and brush out sags or drips in the etching primer before applying the clear coat. • Install all zincs or tape off areas where zinc anodes will be placed before applying Propspeed. Be sure to carefully remove any tape that has been applied before the Prospeed is fully cured. • When coating the blades of the propeller remember to start in the hub area and work your way out to the end of the blade. • The Propprep solution does not contain corrosive inhibitors so the treated surface should be primed and coated with the clear coat as soon as possible after being treated, and defi nitely within 4 hours. • When applying the clear coat be sure to stretch the material out just as you would on the last coat of varnish on any bright work. • We highly recommend two people work together on each application. • After completing the application of the clear coat, visually observe all areas, ensuring there are no misses or gaps. The clear coat will dry to a glossy fi nish, helping the applicator fi nd any uncoated areas. • During cleaning of your hull only use a soft cloth on the Propspeed. If the wiping cloth collects shells remove them before proceeding with the wipe down so as not to damage the Propspeed. Avoid any abrasive cleaning materials or direct high-pressure water. • When hauling your vessel assess the Propspeed condition and reapply if necessary. Most owners reapply Propspeed at the same time as antifoul. • How does Propspeed work? Propspeed’s unique “foul release” formulation produces a surface that does not allow marine growth to permanently attach. • What are the benefi ts of Propspeed? Propspeed will keep your running gear free from marine growth and will increase your vessel’s speed and reduce your fuel consumption. • Is Propspeed environmentally friendly? Yes. Propspeed contains no tin, copper, biocides or pesticides. • Is Propspeed good value? Absolutely! For years boaters have asked for a coating to keep their running gear free of marine growth. 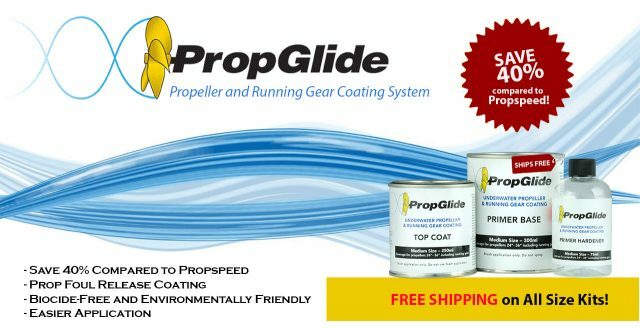 Propspeed not only delivers a coating that answers this call, but will deliver higher speeds and fuel savings, when compared with unprotected running gear. • How long should Propspeed last on my vessel? Propspeed should last at least one year but many customers report up to two years of service. • Do I need anything to maintain my Propspeed application? Propspeed’s unique “foul release” formulation is self-cleaning. However, it is acceptable if your diver gently wipes Propspeed with a non-abrasive cloth, rinsing frequently to avoid collecting shells. • Can I haul my vessel multiple times without having to re-apply Propspeed? Yes. Propspeed can be hauled and launched multiple times without affecting its performance. • Who should apply Propspeed to my vessel? We recommend that you have a certified applicator apply Propspeed to your vessel. • Can I use Propspeed on my Kiwi Props? Yes you can. Preparation is similar to any other Propspeed application, except you do not need to apply the etching primer, just apply the Clear Coat after normal preparation. • Can I spray Propspeed? We do not recommend the spraying of the clear top coat as it is a silicone based product which can easily contaminate other vessels in the yard if not handled correctly. The above information was obtained via the Propspeed Application Manual and updated 8/29/2016. For the most up-to-date information please review the Propspeed OceanMax website. This entry was posted in Prop Coatings and tagged prop gold, propeller paint, propgold, propspeed, propspeed application manual, propspeed limitations, propspeed msds, propspeed sds, propspeed technical data on August 29, 2016 by Jason Revie.